A small routine breaker was getting more and more essential for us. 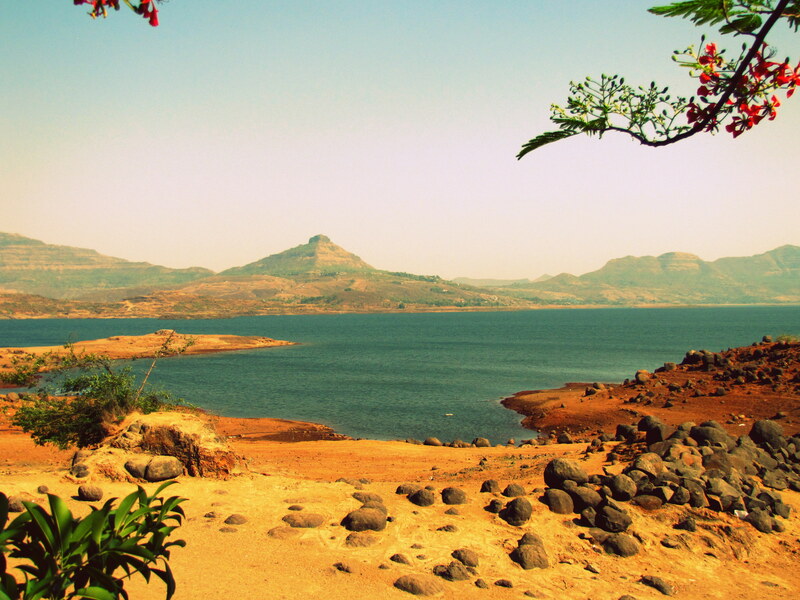 We decided to go camping for a night somewhere close to Pune yet far away from anything commercial. So camping and barbecue was decided and it happened to be at the foothill of Tikona fort overlooking the lovely backwater of the Pavna Dam. As soon as we reached the camp site and saw this strikingly triangular fort (hence called Tikona), we decided we needed a hike to the top. So… we started our climb at 6 am the next day. A short trek up the fort was amazingly interesting because of so many esoteric odds and ends we saw on our way. Our hike didn’t seem too long for sure but we didn’t anticipate the steepness of the fort. It made it more fun because the trail was narrow and lofty, the incline was high and the view was enthralling! While climbing and admiring the early summer morning, we suddenly came to the first interesting facet of the fort. The first entryway called the Bhuyari Darwaza. 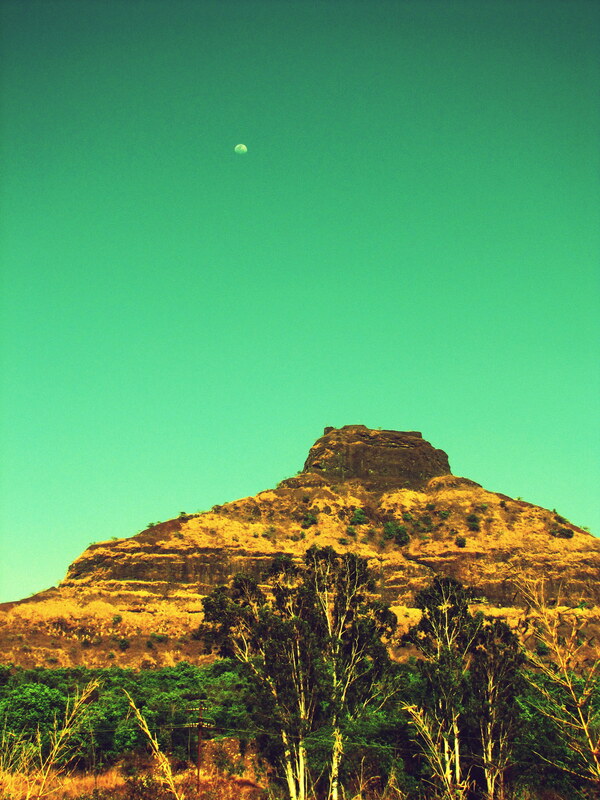 A cave which served as an entrance to this fort is very commonly seen among all forts in Maharashtra. It further led to the watch tower from which the view of the valley was spectacular. This was called the Vetal Darwaza. After this point we came across some very serendipitous things. It started with a huge stone wheel. Beautifully cut and enormous it was, that we wondered who would have moved this. Later we found out that this was used to grind lime to build this fort and was moved with the help of bulls by the Maratha leaders. It wasn’t too long before the statue of “Chapat Maruti” (chapat meaning flat in Marathi language) arrived. 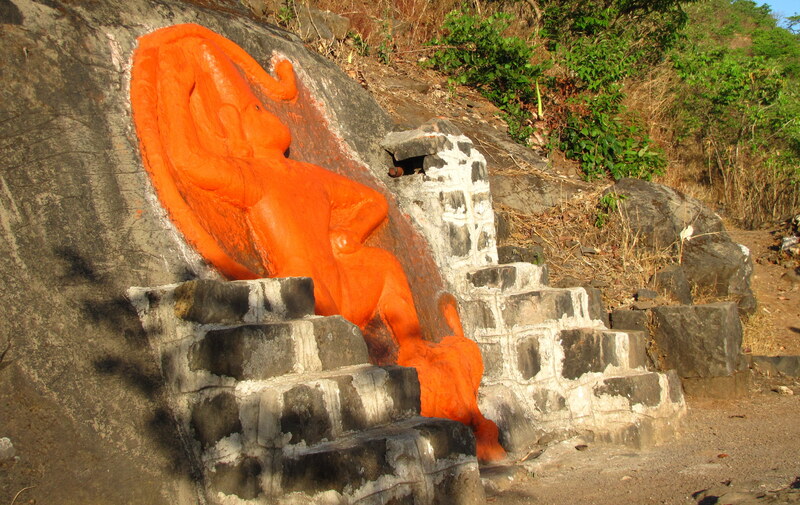 It was a rock craved into the statue of Hanuman and painted bright orange. It was big and is said to protect all the people who climb this fort. While we were getting over the odds on our way, we came across to set of caves. There was a large cave which had a few smaller ones buried into it. 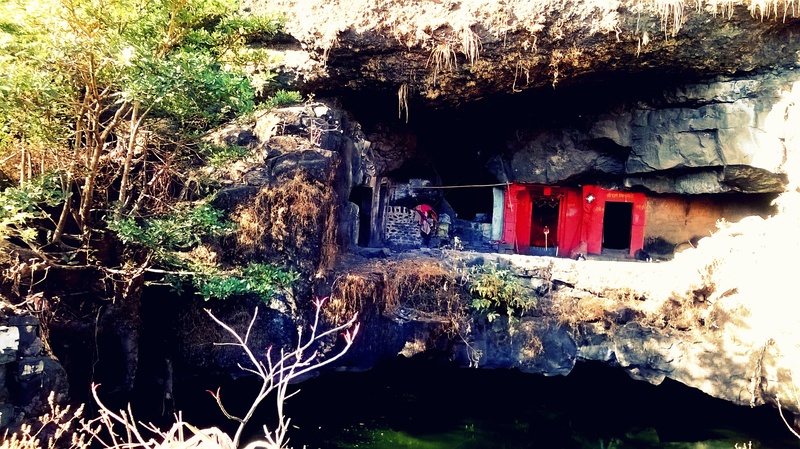 These small caves were Taljai Goddess Temple and Ram Dhyan Mandir. In front of these temples was a small mysterious pond wreathed with thicket of trees and roots seeping into the green waters. In this profoundly mysterious setting was a hermit and when we asked him some questions, he just looked through us. Enchanting as it was, we were looking forward to what we would see next! A few minutes from the temples we realized we would not only see but feel the steepness of the this fort. The tall steps through the various gates made the climb fun. Looking down made us a bit dizzy but couldn’t help noticing the panoramic view of the valley. By the time we reached the 3rd gate, the climb was tough and gradient sharp. This gate was almost a narrow duct guarded with watch towers and water tanks and then came a view so spectacular that we decided to come back here again in the monsoons! We wondered if there was more in store for us. After admiring the view, we continues our climb to the summit. 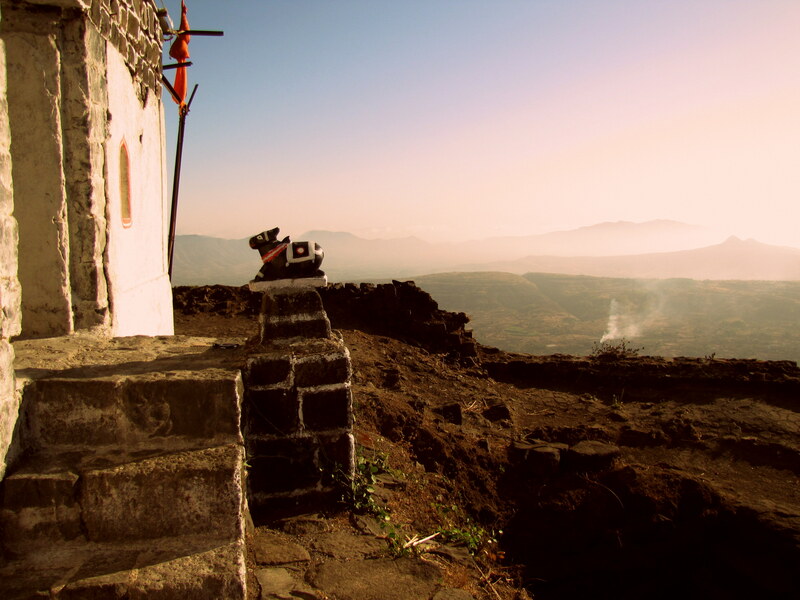 Like all other forts in Maharashtra, this one had a lovely Mahadev (Shiva) Temple on top. 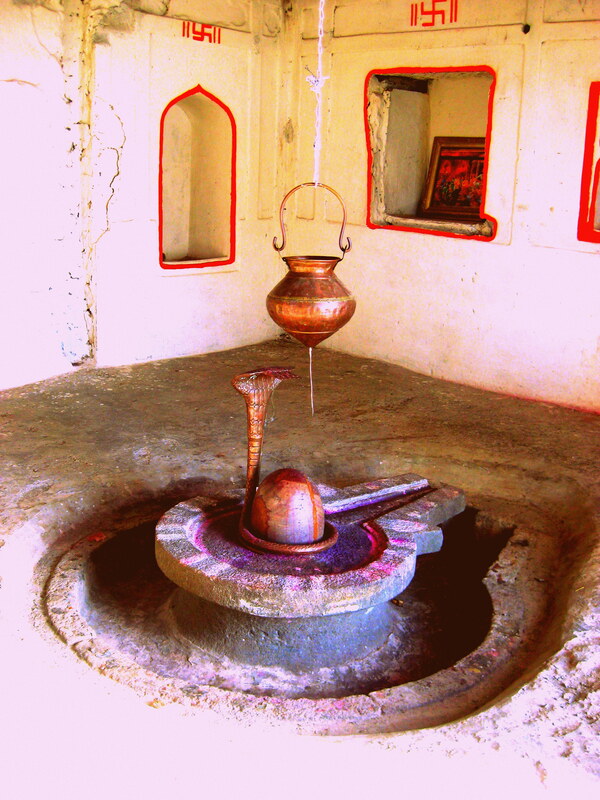 The Shivling was ancient and appealing. The last little climb took us to the flag post where we couldn’t take our eyes off the backdrop. 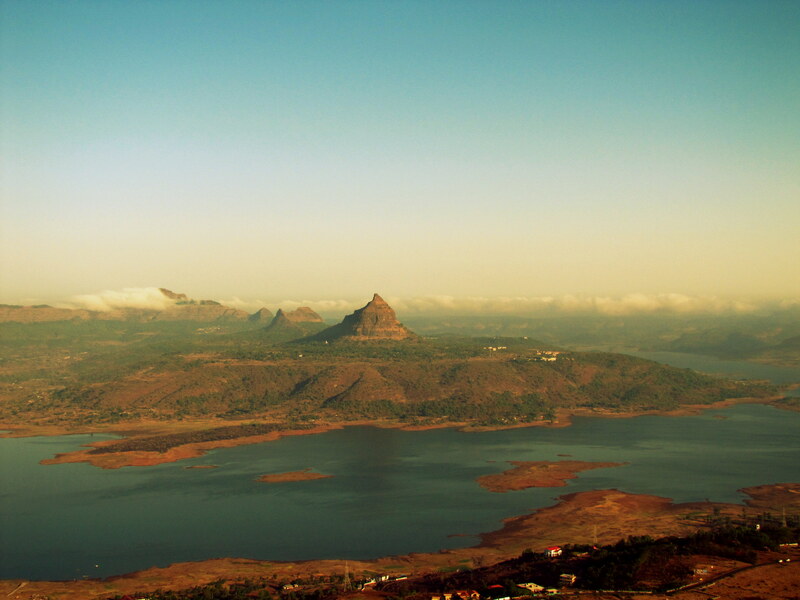 We overlooked the Tung fort which stood tall reaching below to the Pavna Dam backwaters and how the Tikona was standing tall, all strategically located in the middle of the other Sahyadri mountains. We stood there gazing dreamily in to the panorama……And then we knew we had to go back. The sun was getting harsh and we were getting hungry yet leaving this place was difficult. We walked back to our campsite leaving behind the mighty Tikona. Make Peace with Whites & Then, Cool Off with Blues! Your write up is lovely. The pictures are very nice. You went there 2 years ago I think…. Wonderful pics and narration too!! Would love to go there this monsoons. By the way would love to camp out at the base like you did. Are there camping grounds there? Do we have to take any permissions? Thank you so much! Wonderful trekking experience. View from the top is amazing. Yes it is. The climb and the view make it a lovely experience! Tikona fort is awesome. Best part is when you have to climb down the stairs while returning. I couldn’t gather courage to just stand straight and walk. The front view makes you loose all strength in your legs. Agreed…totally!!! It is a bit scary! But it is very exciting as well! Hey Beautifully written post and lovely pics ! Lovely photos! I want to visit this place as soon as possible! Thank you! Please visit whenever you can. The climb and view is lovely! Awesome Clicks and what a trip ! No, i have not been there. Just the other day, i was having the discussion with a friend that Maharastra tourism has done well in marketing the awesome places it has. Dont you agree? If you ever get a chance, don’t miss it! Thank you! it was wonderful!